Kevin Love surreptitiously snapped this and posted it to Instagram, as Team USA flew from Barcelona to London last night. From right to left, front to back, that's LeBron James, Chris Paul, James Harden, Russell Westbrook, Deron Williams, Anthony Davis, and even Mike Kryzyzewski, back in business class. What's your favorite thing about this photo? Davis's camoflage Snuggie? CP3's drool-covered pillow? 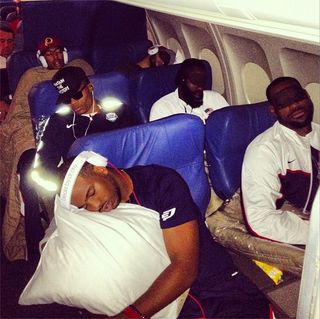 Or the fact that Westbrook wears sunglasses rather than a sleep mask? I want to keep this and treasure this always, because it's a great reminder that there's no way to sleep on an airplane without looking like a doofus, even if you're the men's national basketball team.